“So, I’m Vicky. 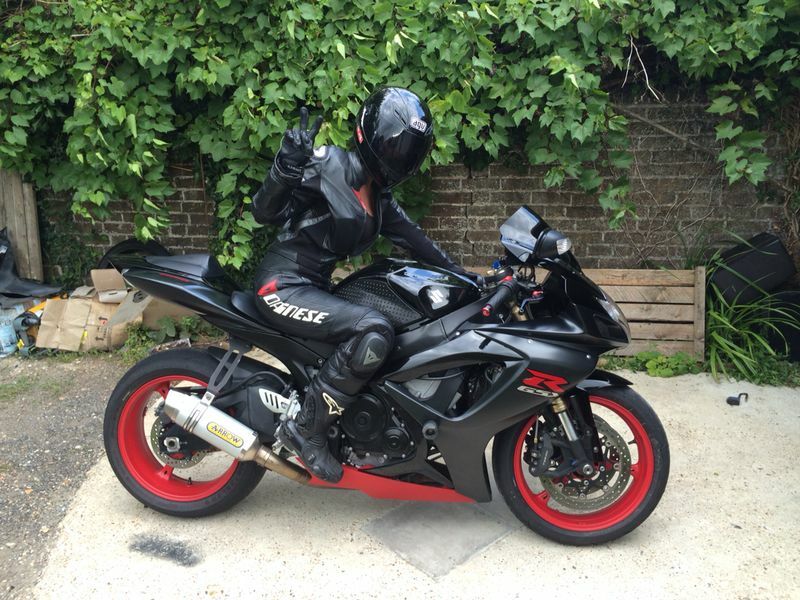 I’m 30 years old, 5’3″ and I ride a Suzuki GSX-R 600 k7. I’m also a – soon to be qualified – female tower crane operator. Yes really. Now while this sounds fairly cool on paper (and certainly a conversation starter) it’s lead me to wonder a few things: 1. why do I try to do things which commonly aren’t things a woman would do? 2. People’s reaction to my chosen occupation / hobby. 3. The challenges and sometimes physical / emotional pain I go through to do them. The first one I guess would be: both subjects are are fairly unusual for a girl to partake in, therefore that makes me fairly unique – I like individuality. I have tattoos for that reason also, although that said, the tattoos may be personal to me and an extension of my individuality, however having them itself is sadly becoming very common – some sort of fashion accessory to some. I digress. It’s not about equal rights or whatever, more about wanting to share the experiences previously only men would have access to. To ride can be thrilling, as can the views from the top of a crane. There is another level to it of course, the cool factor. To some degree everyone on the planet wants to be considered cool or accepted. I envision myself to be some kind of superhero chick on a bike out of Tron wearing a skin tight leather catsuit haha. Reality is somewhat different of course! Since childhood I’ve had acceptance issues, always wanting to impress those closest and in doing so, pushing myself to breaking point. Will power Vs body and head. It’s not always a good thing. In riding, I wasn’t actually sure I’d make it this far. Controlling a motorbike never came naturally to me and the challenges were a constant threat to my enjoyment. The fear of corners, weight of the bike, manually moving it, dropping it and the instability of being on tip toes. It was horrendous. The nerves before each ride were immense. Then there’s the morality of it. Losing someone you were once close to through riding, brings it home. But then everything in life has risk. I guess the rule is to respect it, never get cocky. Know your limits. I had an accident in April. Van pulled out on me and with no physical time to stop, I went straight into him head on. Bike was a cat B write-off, I was really lucky as came away with only a few bruises. Good leathers are EVERYTHING….that was a hot summer evening. If I’d gone out in Jeans and T-shirt, I’d be in a whole other mess. So many friends who ride have described having the same accident. Statistically, each and every one of us are guaranteed to have at least one, so give yourself the best chance and wear the gear. Along with the fears and the nerves, comes the discomfort of being short. I (like I’m sure a lot of girls) always dreamt of owning a sports bike. A Ducati 749 dark to be precise. But reality kicks in again as you try and sit on various bikes, with literally no hope of ever touching the floor! Your boyfriend and riding mates all having the pick of the latest models, while you may as well be sat on a horse! If you’re stubborn (like me) you can get around it. My closest height choices were a Ninja or a Gixxer – which a close friend swore by. So I went with the gixxer. We lowered it, altered suspension and took all the foam out the seat. I’m now fairly comfortable on it. BUT be warned…with the stretch of short arms on a sports, it is not a bike for long rides. After about an hour, my arms and fingers go numb and my shoulders and back begin to scream. Kinda ruins the superhero image doesn’t it?! Labour of love springs to mind. Truth is (as my boyfriend keeps telling me) I should give in and get a monster or er-6 or something more upright. But at least for now, my heart belongs to the gixxer. So why put myself through this? Because the harder the battle, the greater the achievement. For so many men, they’ll never appreciate this battle or understand it…hopefully some women (or shorter men) might. 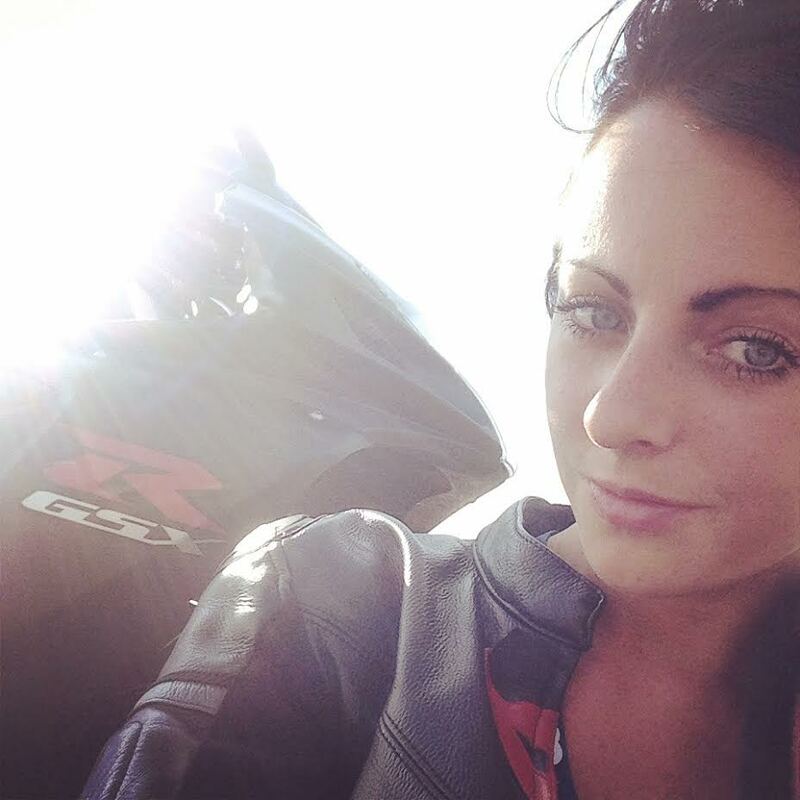 So for that poor girl or woman who’s had the balls to turn up alone to a biker cafe, wobbling as she tries to park 160kgs+ of sports bike for the first time, my heart goes out to you. I only wish all the guys who point and comment under their breath, knew your pain. Lastly this brings me onto people’s reactions to what I do. Owning a bike is cool and most are complimentary about it, sometimes surprised. But the difficulty comes I guess, in proving you can actually ride too. There is an unspoken platform you have to almost live up to in owning a sports bike – you have to ride fast. Tough one. I’ve never worked this one out if I’m honest. Do all farrari owners drive like racers? No. Just because your vehicle can go VERY fast, it doesn’t mean you have to ride it at warp 10. I mean I love MotoGP, met Cal Crutchlow once and been gridgirl at BSB. I’ve stood in the next paddock watching Jenny Tinmouth get ready to race with sheer admiration, I like speed. But do I ride fast myself? No. The most common question riders ask me is: “what’s the top speed I’ve got out of it?” to which I shrink away all embarrassed. I guess the common riding society dictates I should keep up, I should speed up, I should overtake all cars or I’m not really worthy of having a sports bike. I have had a couple of scares in the past (even on my old NSR125) which make me a little more reserved on the speed front, but I am getting faster. Truth is I don’t feel the need to overtake every single car, or constantly break the speed limit. I’m just happy getting more confident. There is however always a fear of non-acceptance if you can’t keep up in groups (of mostly guys) I don’t want to be the annoying slow one. I wish I was fearless, but I’m not. I have to accept that there are people in life who I will never impress and I could (would) literally die trying. Thank you for the submission, Vicky! Have your own story? Share it with me through the contact page! 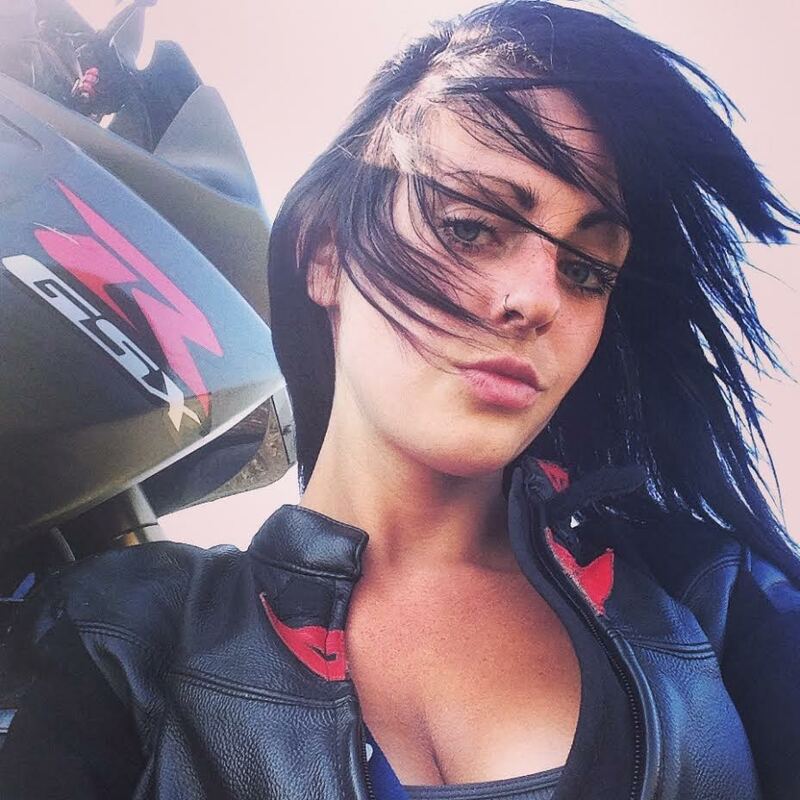 Take a peek at Vicky’s fb community, “Biker Chicks from Sussex“. Thanks for this story. I’m 5,2 and feel your pain. Grats on pushing through all the frustration and being stubborn. On going fast–the reality is you want to keep your license and your life. People that want to race should go to the track, and not endanger the lives of themselves and others (although personally, I LOVE riding fast). Great story. Bikes always make us individual. As for the speed- i’m totally agree, be yourself, ride your speed. I’ve tested and owned some fast bikes and for me the joy of riding them is different from getting them racing all the time, a big challenge though, specially in the streets…it simply such a great fun how they handle and how capable they are. As for the seat height, and i realize, that your’re in love with gixxer (no surprise!! ), but i guess the 690 duke might do it for: compact, punchy, black&orange 🙂 All the best and ride safe. Second. I love your determination and sense. I ride a Triiumph 1050 sprint and yes I can do warp speeds on it but 90% of the time I ride at a comfortable speed well within my riding capabilities, I overtake a lot of cars but thats usually in traffic, filtering or Lanesplitting. And Third: I’m an exponent of ATGATT. (All The Gear All The Time) even in summer (yes we do get them here in England) I use protection (???) Armoured Jeans and a vented jacket. so I whole heartedly agree with your comments on good riding gear (although not neccessarily leathers) I doff my hat to thee my lady, Verily thou hast chosen a mighty steed and doth rideth to enoy and not to impress thine peers..
It’s not about how fast you go compared to others. It’s how fast you go relative to what you’re used to. And about how much you enjoy the way you ride. I think I ride fast, but on a track day, I’m in the slowest 10%. I don’t mind, as long as I learn and I enjoy the ride. I ride a black gixxer too, I’m a bit (ahum) older than you, and I love it when people say when I take my helmet off “oh, I hadn’t expected a woman on that bike”. Hats off to You Lady Vicky. Awesome ! You Look Beautiful & Even More so on the Bike. Great Will power & Determination. Just Keep on Enjoying Your Rides. There is Something Beautiful about a Woman Rider… its a Treat to the Eye. Happy Riding. God Speed Lady. Good on you for making what you love work! I too am short and ride a tall bike. I’ve also worked in non traditional gender jobs most of my working life so I understand. When I tell people that I ride they always ask what kind of bike. They always seem surprised when I tell them that I have a Harley Softail standard and a Kawasaki Concours. They are such different bikes but it’s like, because I’m female, I should have a cute bike like a sporty. I like corners….I mean I really like corners. I outgrew what those cruisers can do. On the connie I cannot touch with both feet so I’ve had to adapt by always putting the same foot down when I stop. I tend to drop my bike…a lot. But I don’t care because I love my bike! People are always suprised at the trips I take on these bikes. Apaerently I’m only expected to tool around town or take a leisurely ride in the country. My longest riding trip was 10,000 miles in 30 days. So I commend you for doing what you love despite the nay sayers and keep it up. Comfort comes with practice and happiness from within!